California State Senate Pro Tem Kevin de Leon (D - Los Angeles) talks to a crowd at Diablo Valley College in Pleasant Hill about SB 54. (March 16, 2017). 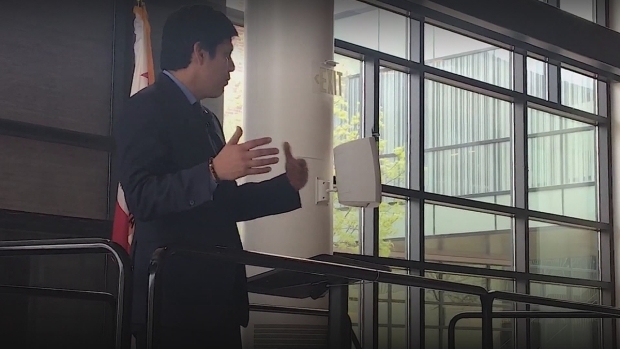 While speaking at Diablo Valley College in Pleasant Hill on Thursday, State Senate Pro Tem Kevin de Leon conceded that his “Sanctuary State” bill wouldn’t provide the absolute protections many immigrant advocates want — but he said it’s a crucial step in taking a stand against the Trump administration. Instead, he said, SB 54 would prevent California tax dollars from being used as a “cog in the Trump deportation machine” by restricting local and state agencies from cooperating with ICE, with a few exceptions for task forces. “For deportations to succeed, you need to commandeer the local law enforcement agencies,” de Leon told listeners, when asked about the bill’s effectiveness. The state's Democratic leaders have been pushing for legislation to protect immigrants since the 2016 election, during which President Donald Trump rode a wave of anti-immigrant rhetoric to victory. Since January, Trump's flurry of executive orders — from threatening to cut federal funding for sanctuary cities to his twice-blocked travel ban — created the need for "urgency bill," de Leon said. Officially titled the “California Values Act,” the polarizing piece of legislation passed its first major hurdle on a party-line vote last Monday and is now headed to the full Senate for approval. It is arguably the state’s strongest rebuke of the Trump administration thus far. Predictably, it has not been well-received among the state's conservatives and law enforcement agencies. "If SB 54 passes, it will allow dangerous, violent career criminals to slip through the cracks and be released back into our communities," Sacramento County Sheriff Scott Jones told reporters last week. Detractors also argued that it would bar county sheriffs from leasing jail space to federal immigration officials, a controversial yet lucrative contract in Contra Costa County that helps the sheriff’s department rake in about $3 million annually. de Leon’s visit comes nearly two months after the Contra Costa Community College Board passed its version of a sanctuary campus policy, while a spate of sanctuary resolutions are popping up on city council agendas each week. The day before de Leon’s appearance, Martinez passed a resolution of its own. Next week, grassroots advocates are set to attend the Pleasant Hill City Council meeting to urge the council there to do the same. But efforts haven’t been universally successful: After a contentious council meeting, Dublin leaders made it clear that no similar resolution would pass under their purview. When asked if passing largely symbolic resolutions is worth the effort, de Leon told a listener that it was.